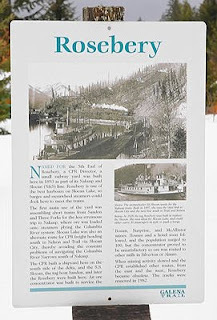 silver mining history includes Rosebery. was named for the 5th Earl of Rosebery. servicing the various silver mines in the area. after the towns of Nakusp and Slocan. The Galena Trail follows part of the old railway bed. off of the distant mountains. British Columbia is full of majesty and history. I am still exploring and learning.